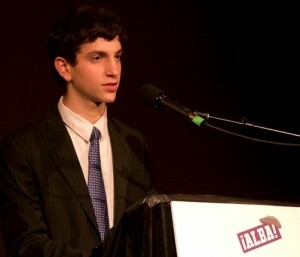 Andrew Plotch, the winner of the 2012 ALBA-Puffin Foundation Youth Activist Award and a high school senior in New Jersey, is the creator and leader of the nationwide Fight Apathy Campaign, reaching over 80,000 high school students in 21 states and two territories. During Fight Apathy Week, students participated in political discussions at school, both inside the classroom and out. At Fight Apathy events every student receives a sticker with the text “I believe in…”, allowing every student to fill in the blank. The stickers serve as catalysts for discussions about such topics as political morality, fiscal policy, and elections. Andrew Plotch received ALBA’s student award in 2010. Photo Richard Bermack. The campaign, which Andrew started just before he received the ALBA award in 2012, began in his school, Bergen Academies. It has now become a nationally sponsored initiative of Junior Statesmen of America, won support from Rock the Vote, and attracted widespread media attention. More information about the campaign can be found at fightapathy.jsa.org.